The 42" round table top is constructed of thermal fused melamine that protects against stains, burns, bumps and bruises. A black PVC edge adds extra protection. The Kobe x-base is constructed of black tubular steel with a smooth powder coat finish. Table feet feature adjustable glides and end caps for a clean finish. 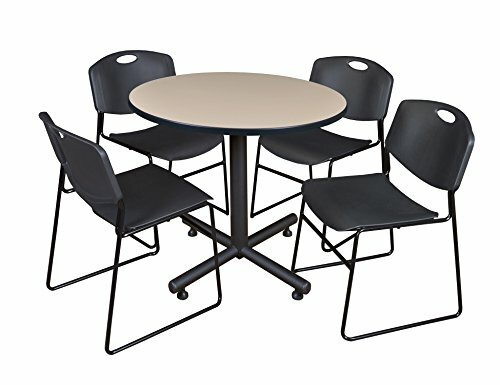 Table is ideal for training rooms, lunch rooms, restaurants, cafes, or small conference rooms. The Zeng stack chairs feature sturdy black metal frames with glides to eliminate floor damage. A color permeated seat and back is contoured for additional comfort. These chairs can be stored in stacks on 25.